This UV Filter blocks the invisible Ultra Violet component of light from the sky, which can cause blur and to which many color films react with a blue cast. These filters should be called UV-Blocking Filters, because there are filters for technical applications that pass UV radiation and block all the other wavelengths. Nevertheless, the short term “UV Filter” has become established among photographers. UV Filters are ideal for photography in high altitudes (in the mountains), by the sea and in regions with very clean air. The pictures gain brilliance and disturbing blue casts are avoided. Because the glass is colorless, color rendition is not altered, aside from the elimination of the unwanted blue cast, and no increase in exposure is required. That makes a UV Filter very suitable as protection of the front element of the taking lens against dust, flying sand, sea water spray and the like, and it can be kept on the lens at all times. It is recommended for analog color and black-and-white as well as digital photography. Illustration of lotus effect on water droplet caused by nano coating. droplet caused by nano coating. The nano coating is an outer layer of protection that comes standard with all XS-Pro Digital MRC filters. The nanotechnology based characteristic (lotus effect) produces a better beading effect with water, making the cleaning of this filter even simpler and faster than ever before. MRC nano has an improved outer (8th) layer over regular MRC. The lens elements of high-quality lenses and the plano surfaces of filters require a perfect shape and smoothness to achieve the best optical quality. Dirt, greasy fingerprints, water marks and scratches reduce the image contrast and the sharpness, which can result in blooming at light sources and have an effect similar to a soft-focus lens. A clean front lens element and clean filter surfaces are therefore an absolute pre-requisite for demanding photographers. The nano coating results in lotus effect on water droplet. The MRC coating is first and foremost a broadband anti-reflection coating. This means that its reflection-reducing effect, which is thus also a transmission-increasing effect, i.e. one which suppresses scattered light and ghost images and transmits more light, has a broadband action over the full spectrum. In contrast, the (almost always blue) single-layer coating only has a high effect in the medium wavelength range around yellow and yellow-green where the eye is most sensitive to light, while its effect is greatly reduced toward the blue-violet and purple-red end regions of the visible spectrum. With the MRC coating, this blue, violet and red to deep-red light cannot produce any contrast reducing scattered light, spotty reflections or ghost images. A broadband effect can only be achieved with a multilayer coating which requires a much higher effort and precision because unevenness and irregularities of the individual layers build up on one another and amplify one another. Schneider therefore uses a plasma-assisted evaporation coating process in which inert gas ions accelerated in an electrical field compact the material deposited on the lens surface in the vacuum chamber. For photographers, the main advantage of MRC coating, is it's ability to combat flare and ghosting. An added benefit is that their filters remain free of dirt longer, so that they do not have to be cleaned so often. When cleaning the filter does become necessary, it is a lot easier to wipe off the dirt with a blower brush, because of MRC's ability to repel dirt and moisture. This also reduces the risk of micro-scratches which can occur during cleaning. Side view of XS-Pro Digital Rotating Mount. This UV Filter blocks the invisible UV component of light from the sky, which can cause blur and to which many color films react with a blue cast. These filters should be called UV-Blocking Filters, because there are filters for technical applications that pass UV radiation and block all the other wavelengths. Nevertheless, the short term "UV Filter" has become established among photographers. UV Filters are ideal for photography in high altitudes (in the mountains), by the sea and in regions with very clean air. The pictures gain brilliance and disturbing blue casts are avoided. Because the glass is colorless, color rendition is not altered, aside from the elimination of the unwanted blue cast, and no increase in exposure is required. 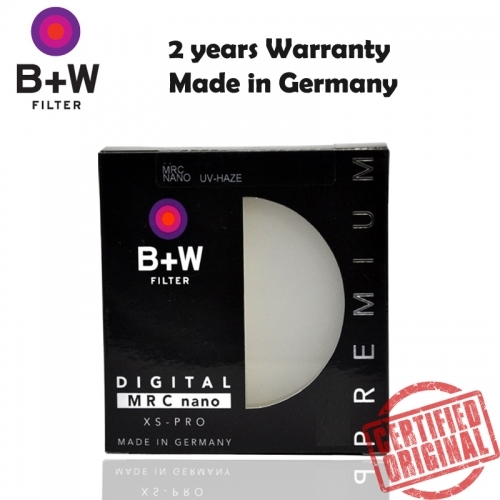 That makes a UV Filter very suitable as protection of the front element of the taking lens against dust, flying sand, sea water spray and the like, and it can be kept on the lens at all times. It is recommended for analog color and black-and-white as well as digital photography.